About the author, John Harris: “He writes like one, who has long been accustomed to ‘sit at the feet of Jesus,’ and has eminently profited under his teaching. Instead of asking what other men have thought of The great teacher, and borrowing their opinions, to help make out a respectable volume, he has evidently heard for himself, and he gives us his own impressions vividly and forcibly, just as he received them” (The great teacher: Introduction, p. xviii, 1835). In contrast, Ellen white, who claimed to be ‘more than a prophet,’ resorted to borrowing for her works from John Harris and countless other authors! Ellen White (1827-1915): “We see by faith the stamp of divinity upon the human children of God. We see those who have noble intellectual and moral powers” (Ellen G. White 1888 Materials, p. 1514). John Harris (1802-1856): “The stamp of the Divinity upon a child of the dust! What noble intellectual and moral powers!” (The Great Teacher, p. ix, 1836). Ellen White (1827-1915): “The significance of the Jewish economy is not yet fully comprehended. Truths vast and profound are shadowed forth in its rites and symbols. The gospel is the key that unlocks its mysteries… Thousands more may engage in the work of searching out the mysteries of salvation. As the life of Christ and the character of His mission are dwelt upon, rays of light will shine forth more distinctly at every attempt to discover truth. Each fresh search will reveal something more deeply interesting than has yet been unfolded. The subject is inexhaustible. The study of the incarnation of Christ, His atoning sacrifice and mediatorial work, will employ the mind of the diligent student as long as time shall last; and looking to heaven with its unnumbered years he will exclaim, “Great is the mystery of godliness”” (COL, pp. 133, 134, 1900). John Harris (1802-1856): “And what is the Jewish economy, if we desire to reach its interior truths, but a vast profound, elaborated enigma, – to which the gospel indeed brings us the key…the ‘treasures of wisdom and knowledge’ which they contain, are literally inexhaustible… Were a thousand of the most gifted and holy men now on earth, to ‘set the lord Jesus always before them,’ and spend their whole lives in studying his adorable character, they would be so far from exhausting the theme, that other thousands more gifted and more holy might find ample scope for the employment of their powers, down to the end of time… Nor can it be doubted, that the mysteries of redemption, including the divine mediatorial character, the incarnation and atoning sacrifice of the Son of God, will employ the minds, the hearts and tongues of the Redeemed, through everlasting ages” (The Great Teacher, pp. xxiii, xvi, xvii, 1836). Ellen White (1827-1915): “Other blessings they desire; but that which God is more willing to give than a father is to give good gifts to his children; that which is offered abundantly, according to the infinite fullness of God, and which, if received, would bring all other blessings in its train” (Counsels to Parents, Teachers and Students, p. 358). John Harris (1802-1856): “Other blessings are desired; but this, which would bring all blessings in its train, which is offered in an abundance corresponding to his infinite plenitude, an abundance, of which the capacity of the recipient is to be the only limit,…descends more copiously than the offered” (The Great Teacher, p. xxvi, 1836). Ellen White (1827-1915): “As her heart overflowed with the sense of the goodness of God to her and to His church, she chose to express her feelings in phrases from God’s Word and also in the wording of a book she had recently read, The Great Teacher, by John Harris, published in 1836. Such a procedure was not uncommon in her work. She found the language choice and the truth well expressed. [In his introduction to the volume from which Ellen White drew some expressions, Harris wrote: “Suppose, for example, an inspired prophet were now to appear in the Church, to add a supplement to the canonical books—what a babel of opinions would he find existing on almost every theological subject! And how highly probable it is that his ministry would consist, or seem to consist, in a mere selection and ratification of such of these opinions as accorded with the mind of God. Absolute originality would seem to be almost impossible. The inventive mind of man has already bodied forth speculative opinions in almost every conceivable form, forestalling and robbing the future of its fair proportion of novelties and leaving little more, even to a divine messenger, than the office of taking some of these opinions and impressing them with the seal of heaven.”—John Harris, The Great Teacher, pp. XXXIII, XXXIV. ]” (4BIO, p. 62). John Harris (1802-1856): “Suppose, for example, an inspired prophet were now to appear in the church, to add a supplement to the canonical books, – what a babel of opinions would he find existing on almost every theological subject! – and how highly probable is it that his ministry would consist, or seem to consist, in the mere selection and ratification of such of these opinions as accorded with the mind of god. Absolute originality would seem to be impossible. The inventive mind of man has already bodied forth speculative opinions in almost every conceivable form; forestalling and robbing the future of its fair proportion of novelties; and leaving it little more, even to a divine messenger, than the office of taking some of these opinions, and impressing them with the seal of heaven” (The Great Teacher, p. xxxi, 1836). Ellen White (1827-1915): “Numberless pens have been employed in presenting to the world the life, the character, and the mediatorial work of Christ” (RH, April 4, 1899). John Harris (1802-1856): “Innumerable pens have been employed upon the life, character, preaching and mediatorial work of Christ” (The Great teacher, p. xvi, 1835). Ellen White (1827-1915): “The church members need to know from experience what the Holy Spirit will do for them. It will bless the receiver, and make him a blessing. It is sad that every soul is not praying for the vital breath of the Spirit, for we are ready to die if it breathe not on us. We are to pray for the impartation of the Spirit as the remedy for sin-sick souls. The church needs to be converted, and why should we not prostrate ourselves at the throne of grace, as representatives of the church, and from a broken heart and contrite spirit make earnest supplication that the Holy Spirit shall be poured out upon us from on high? Let us pray that when it shall be graciously bestowed our cold hearts may be revived, and we may have discernment to understand that it is from God, and receive it with joy” (Testimonies to Ministers and Gospel Workers, p. 64, 1896 ). John Harris (1802-1856): “The church itself requires conversion… I say their conversion to the Spirit, – for the change necessary has all the characteristics of conversion… casting themselves down, and lying prostrate at the foot of the throne of grace, and as the representatives of the church, exclaiming, ‘Behold, O Lord, a poor company of creatures gasping for life! Thy Spirit is vital breathe, we are ready to die, if thy Spirit breathe not. … have we not deplored the absence of the Spirit as the great affliction of the church, and implored his impartation as our great want, our only remedy? But ‘the Spirit will be poured out from on high’…” (The great teacher, pp. xxvii, xxviii, 1836 ). 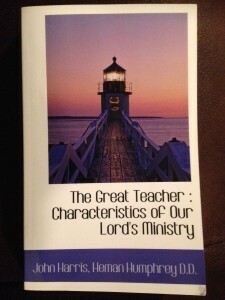 Ellen White (1827-1915): “The forbearance of the Lord is wonderful; He putteth constraint upon His own attributes. Omnipotence exerted over Omnipotence. Why hath God kept silence? Why hath He forborne so long in looking for centuries upon a people who despised His goodness and forbearance and patience. He sees His holy law prostrated, broken, trampled under foot, by a rebellious confederate people, who give themselves to work evil, cooperating with evil angels. The whole apostasy of evil angels has conspired with evil men, and gathered in strong armies to destroy the champions of God and the truth. The Lord will come out of His place to punish the inhabitants of the earth for their iniquity, and the earth shall disclose her blood, and no more cover her slain” (6MS, p. 392). John Harris (1802-1856): “‘God sent not his Son into the world to condemn the world, but that the world through him might be saved.’ In order to enhance our views of the divine compassion, the Savior, in this language, reminds us of the terrible alternative which outraged Omnipotence might have adopted. He carries back our thoughts to the time when God, after looking with centuries of patience and forbearance on the unparalleled spectacle of his holy law prostrate, and broken, and trampled under foot by a confederated race of rebellious creatures, came forth out of his place, and punished the inhabitants of the earth for their iniquity; swept them away with a flood as with a besom of destruction” (The great teacher, p. 94, 1836). Ellen White (1827-1915): “But thou, Bethlehem Ephratah, tho thou be little among the thousands of Judah, yet out of Thee shall He come forth unto Me that is to be ruler in Israel; whose goings forth have been from of old, from everlasting… In speaking of His pre-existence, Christ carries the mind back through dateless ages. He assures us that there never was a time when He was not in close fellowship with the eternal Go” (ST, August 19, 1900). John Harris (1802-1856): “The pen of inspiration had recorded that his goings forth had been from everlasting: in illustration of this sublime truth, he raised the veil of the past eternity, carried back their thuoghts through dateless ages before the world began, towards the unimaginable and awful place where God dwells, assuring them that there never was a period when he was not there… in a fellowship of glory with Deity” (The Great teacher, pp. 116, 117, 1836). Ellen White (1827-1915): “Are there not twelve hours in the day.”… Christ points out to us that which he expects us to do. He has given us a glimpse of eternity, that we may realize that there is something higher than temporal things to engage our attention, and call into activity all our delegated powers… It is the almost universal practise of men to subordinate the eternal to the temporal; the claims of the future, the unseen, to the common affairs of the present. But Christ declares, “Ye cannot serve God and Mammon.” “No man can serve two masters.” (RH, Jan 11, 1898). John Harris (1802-1856): “He calmly enquires, ‘Are there not twelve hours in the day? … And having engaged us in his service, and pointed out our duty, he gives us a glimpse of eternity to quicken the pulse of activity… But the fatal and universal propensity of man to subordinate the claims of the future to the affairs of the present… he claims, ‘No man can serve two masters, whose interests clash’” (The Great Teacher, pp. xxxviii, xxxix, 1835). Ellen White (1827-1915): “In his teaching, he drew his illustrations from the great treasury of household ties and affections, and from nature…with which the people were most familiar” (Special testimonies on Education, p. 64; Counsels to Parents, Teachers, and Students, p. 178). John Harris (1802-1856): “He drew his images and illustrations from the great treasury of our household affections, and from the familiar features of nature” (The Great Teacher, p. 84, 1836). Ellen White (1827-1915): “Through Christ we may comprehend something of him who is glorious in holiness. Jesus is the mystic ladder by which we may mount to behold the glory of the infinite God. By faith we behold Christ standing between humanity and divinity, connecting God and man, and earth and heaven” (ST, January 20, 1890, par. 5). John Harris (1802-1856): “… we behold the invisible God invested in the robes of humanity, and emitting a glory so softened…to raise our thoughts to God, the idea of Jesus comes to our aid, like the mystic ladder of the patriarch’s dream… we behold him by faith, standing betwixt us and the eternal throne” (The great teacher, pp. 124, 125, 1836). Ellen White (1827-1915): “He set up his tabernacle in the midst of our human encampment, pitched his tent by the side of the tents of men, that he might dwell among them and make them familiar with his divine character and love” (ST, January 20, 1890). John Harris (1802-1856): “… he came and set up his tabernacle in the midst of the human encampment, pitched his tent side by side with our tents, to attest the presence of God, to make us familiar with his character, and sensible of his love” (The Great teacher, p. 129, 1836). Ellen white (1827-1915): “Then we shall be loved by the Father as he loves his Son. Jesus declares that nothing less than oneness with him and his Father will ever satisfy the divine requirement; but when we are united with Christ, our life is hid with Christ in God, and we are represented as members of the body of Christ. Christ may abide in our hearts by faith. God manifested in the flesh is the mystery that has been hidden “from ages and from generations”” (Signs of the Times, May 18, 1891). John Harris (1802-1856): “… as soon as we become united to him, the father loves us as parts of Christ, as members of that mystical body of which Christ is the glorified head… That God should be manifested in the flesh, was truly the mystery which had been hid from ages, and from generations” (The great teacher, pp. 160, 160, 1836 ). Ellen white (1827-1915): “All this could be, because Christ laid hold of the nature of man, and partook of the divine attributes, and planted his cross between humanity and divinity, bridging the gulf that separated the sinner from Go” (RH, December 22, 1891). John Harris (1802-1856): “He laid hold on the nature of man: and planting his cross midway, created a point of attraction which reached and drew them across the separating gulp, back to itself, as to a common centre” (The great teacher, p. 163, 1835). Ellen white (1827-1915): “So perfect was the example and life of Christ, that not the least jot of inconsistency existed between His instructions and His life” (12 MR, p. 334, 1990). John Harris (1802-1856): “So perfect was his example, that had it been possible for the least inconsistency to have existed between his instructions and his life…” (The great teacher, p. 79, 1835). Ellen white (1827-1915): “The Father loves us, not because of the great propitiation, but He provided the propitiation because He loves us. Christ was the medium through which He could pour out His infinite love upon a fallen world… God suffered with His Son. In the agony of Gethsemane, the death on Calvary, the heart of Infinite Love paid the price of our redemption. Jesus said, “Therefore doth My Father love Me, because I lay down My life, that I might take it again.” John 10:17. That is, “My Father has so loved you that He even loves Me more for giving My life to redeem you. In becoming your Substitute and Surety, by surrendering My life, by taking your liabilities, your transgressions, I am endeared to My Father; for by My sacrifice, God can be just, and yet the Justifier of him who believeth in Jesus” (SC, pp.13, 14, 1892). John Harris (1802-1856): “…the Father loves us, not in consequence of the great propitiation, but that he provided the propitiation because he loved us; because he was bent on obtaining a medium through which he could pour out the ocean-full of his love upon us… Therefore doth my father love me, because I lay down my life, that I might take it again… in other words, ‘My father loves you with a love so unbounded, that he even loves me the more for dying to redeem you… by sustaining your liabilities, by surrendering my life as an equivalent for you transgressions, and thus vindicating his law…” (The Great Teacher, pp. 97, 98, 1836). Ellen white (1827-1915): “Selfishness would make a monopoly of eternal life. The Jewish nation thought to confine the benefits of salvation to their own nation; but the world’s Redeemer showed them that salvation is like the air we breathe, like the atmosphere that belongs to the whole world. Every soul can be enriched by the love of God. The selfishness that would number Israel is an offense to God; for God’s gift belongs not to a select few but to the whole word” (RH, November 12, 1895). John Harris (1802-1856): “Human selfishness would make a monopoly of eternal life. The Jewish Christians would fain have made it a local and national benefit; till the unconfinable spirit came, and showed them that, like air, it belonged to the world. And the inheritors of their selfishness, in every succeeding age, have attempted to number Israel, to count the people, have adhered to the persuasion that the great gift of eternal life is only to be offered to a party” (The Great Teacher, p. 103, 1836). Ellen white (1827-1915): “In the person of Christ we behold the eternal God engaged in an enterprise of boundless mercy toward fallen man. Christ clothed his divinity with humanity, that his humanity might touch humanity, and divinity reach divinity” (ST, August 20, 1894). John Harris (1802-1856): “In the person of Christ we behold the eternal God engaged in an enterprise of boundless mercy. To aid our conceptions of his being, he clothes his spirituality in the vestments of humanity” (The Great Teacher, p. 109, 1836). Ellen white (1827-1915): “He rescued the truth from the companionship of error, and sent it forth free to the world. He caused it to shine in its own native clearness and purity; for he designed that it should illuminate the dense darkness of the earth and the gross darkness of the people” (RH, Feb 1, 1898). Ellen white (1827-1915): “He rescued truth, eternal truth, from the base companionship of error, and commanded it to shine forth in all its brightness and heavenly luster. He set the truth on high, in order that like a light it might illuminate the moral darkness of the world. He rescued every gem of truth from the rubbish of men’s maxims and traditions, and exalted the truth to the throne of God from whence it had issued” (RH, August 6, 1895). John Harris (1802-1856): “And more than that, he redeemed it from the base companionship of error, and made it free of the universe. He not merely rescued if from the gloomy region of doubt, but enabled it to shine in its own right, and to illuminate the surrounding darkness. If he found it one of the multitude, he raised it to the throne” (The Great Teacher, p. xxxii, 1836). Ellen white (1827-1915): “Jesus Christ came into our world and assumed our nature, in order that God might be glorified in humanity, in order that humanity might be uplifted and glorified in Christ… Christ rejoiced in the secret consciousness of what he purposed to do for man. He desires to do far more abundantly than we are able to ask or think. The fountain of his inexpressible love is inexhaustible, and it flows toward all those who believe in him” (YI, March 12, 1896). John Harris (1802-1856): “He assumed our nature for no other purpose than to display the glory of God in the happiness of man… he rejoiced in the secret consciousness that he intended to do abundantly more than he had said… he held within his heart a fountain of compassion, … would issue forth, far exceeding expectation, and blessing the world” (The Great teacher, p. 82, 1835). Ellen White (1827-1915): “Christ came to demolish every wall of partition, to throw open every compartment of the temple, that every soul may have free access to God” (COL, p. 386, 1900). John Harris (1802-1856): “Christ came to demolish every wall of partition, to throw open every compartment in the temple of creation, that every worshipper might have free and equal access to the God of the temple” (The Great Teacher, p. 112, 1835). Ellen White (1827-1915): “He had succeeded in establishing idolatry in every part of the earth except the land of Palestine. To the only land that had not fully yielded to the tempter’s sway” (4SP, p. 332, 1884). John Harris (1802-1856): “But, in order that earth might not quite forget its rightful Lord, Jehovah was pleased to select a people and erect a temple, expressly for the maintenance of his true worship… For ages previous to the divine advent, the world seemed almost entirely his own… Nor did Judea itself form an exception to this wide infernal sway; for (short of formal idolatry) it belonged to the universal confederacy, and formed one of the fairest and most faithful provinces of the satanic empire” (The Great teacher, p. 229, 1835). Alfred Edersheim (1825-1889) also had shed some light on this: “The pilgrim, who leaving other countries, entered Palestine, must have felt as if he had crossed the threshold of another world… To the orthodox Jew the mental and spiritual horizon was bounded by Palestine. It was ‘the land’; all the rest of the world, except Babylonia, was ‘outside the land’” (Life and Times of Jesus the Messiah, Vol. 1, p. 84, 1883). Ellen White (1827-1915): “When Christ bowed his head and died, he bore the pillars of Satan’s kingdom with him to the earth” (YI, April 25, 1901). John Harris (1802-1856): “… in bowing his head he was dragging the pillars of their empire to the dust” (The great teacher, p. 234, 1835). Edward Griffin (1770-1837): “When Satan nailed the Saviour to the cross, he thought he had triumphed; but he had only pulled the building down upon his own head” (God Exalted and creatures Humbled by the Gospel, p. 27, 1830). Ellen White (1827-1915): “Who can measure or anticipate the gift of God? For ages sin had interrupted the flow of divine benevolence to man; but God’s mercy and love for the fallen race have not ceased to accumulate, nor lost their earthward direction” (ST, Nov, 17, 1898). John Harris (1802-1856): “But who shall anticipate the gifts of infinite love? … Though sin for ages disturbed the equable flow of the divine benevolence to man, that benevolence had never, for a moment, ceased to accumulate, or lost its earthward direction” (The Great Teacher, p. 101, 1835). Ellen White (1827-1915): “Sing unto the Lord, bless his name; shew forth his salvation from day to day… We would lift Him up in songs of praise. Through the psalmist Christ declared, “In the midst of the congregation will I praise thee” (Psalm 22:22). His voice was the keynote of the universe” (In Heavenly Places, p. 248, 1967). John Harris (1802-1856): “… had called on everything that hath breath to join in a full concert of praise to God. But her most effort was only a preluding flourish, till he should come to lead the song, who had said, ‘In the midst of the church will I sing praise unto thee.’… His voice gave the key-note to the universe” (The Great Teacher, p. 172, 1835). Ellen White (1827-1915): “The Great Teacher held in his hand the entire map of truth, but he did not disclose it all to his disciples. He opened to them those subjects only which were essential for their advancement in the path to heaven” (RH, April 23, 1908). John Harris (1802-1856): “… though the Great Teacher held in his hand the entire map of truth, he disclosed only so much of the part in question as related to our path to heaven” (The great teacher, p. 212, 1835). Ellen White (1827-1915): “The ordinances of baptism and the Lord’s Supper are two monumental pillars, one without and one within the church. Upon these ordinances Christ has inscribed the name of the true God. Christ has made baptism the sign of entrance to His spiritual kingdom… Baptism is a most solemn renunciation of the world. Those who are baptized in the threefold name of the Father, the Son, and the Holy Spirit. Before man can find a home in the church, before passing the threshold of God’s spiritual kingdom, he is to receive the impress of the divine name” (6T, p. 91, 1901). John Harris (1802-1856): “Our Lord instituted two ordinances – baptism and the Lord’s supper; he erected but two monumental pillars; one without, and the other within the church. On the first of these, that which fronts the world, he inscribed the great name of the triune God… Baptism is the vestibule, or entrance, to his spiritual temple, the church; so that before his disciples can pass the threshold, he requires them to receive the print of the Sacred Name… By baptizing us unto the threefold name of God” (The Great teacher, p. 213, 1835). Ellen White (1827-1915): “A crisis has arrived in the government of God in which something great and decisive must be done. The delay will not be prolonged long. The wrath of…God will not be long withheld” (The Ellen G. White 1888 Materials, p. 448). Ellen White: “A crisis has arrived in the government of God on earth… Everything has been moving on just as the Lord has revealed in prophecy that it would. Something great and decisive is soon to take place, else no flesh would be saved. The character of God will not be compromised. Under the wrath of God universal desolation will soon reach all parts of the known world. There have been lightnings and earthquakes, fires and floods, calamities by sea and by land; but who reads these warnings? What impression is made upon the world? What change in their attitude is seen?” (18MR, p. 57). Ellen White: “A crisis is to be revealed in the great and prolonged controversy in the government of God on earth. Something great and decisive is to take place, and that right early. If any delay, the character of God and his throne will be compromised. The armory of heaven is open; all the universe of God and its equipments are ready. One word has justice to speak, and there will be terrific representations upon the earth, of the wrath of God. There will be voices and thunderings and lightnings and earthquakes and universal desolation. Every movement in the universe of heaven is to prepare the world for the great crisis” (An Appeal to Our Ministers and Conference Committees, p. 38, 39, 1892). John Harris (1802-1856): “A crisis had arrived in the government of God on earth, in which something great and decisive must be done; prolong the delay – and the character of God will be compromised and gone; the voices of the souls beneath the altar were wearied with crying for retribution; the armory of heaven was open; all its hosts and equipments ready… The Son of God had only to pour out the vial of incensed wrath, and there had been voices, and thunderings, and lightnings, and earthquqkes, and universal desolation” (The great teacher, p. 103, 1835). Ellen White (1827-1915): “The church is the repository of the riches of the grace of Christ… The church is God’s fortress, His city of refuge, which He holds in a revolted world… He has sent forth His angels to minister to His church, and the gates of hell have not been able to prevail against His people… It is the theater of His grace, in which He delights to reveal His power to transform hearts” (AA, pp. 9, 11, 12, 1911). John Harris (1802-1856): “The church is his mystical body; … It is the theatre of his grace, in which he is making experiments of mercy on human hearts, and effecting transformations… and his church is the repository in which all that wealth is stored… his rich and constant supplies of grace… and the encompassing wall of fire into which his perfections kindle for her protection; a wall in which the gates of hell shall not break and enter” (The Great teacher, p. 225, 1835). Ellen White (1827-1915): “Consider, my brethren and sisters, that the Lord has a people, a chosen people, His church, to be His own, His own fortress, which He holds in a sin-stricken, revolted world; and He intended that no authority should be known in it, no laws be acknowledged by it, but His own. … Satan has a large confederacy, his church. Christ calls them the synagogue of Satan because the members are the children of sin. The members of Satan’s church have been constantly working to cast off the divine law, and confuse the distinction between good and evil. Satan is working with great power in and through the children of disobedience to exalt treason and apostasy as truth and loyalty. And at this time the power of his satanic inspiration is moving the living agencies to carry out the great rebellion against God that commenced in heaven… There are clear, decided distinctions to be restored and exemplified to the world in holding aloft the commandments of God and the faith of Jesus. … His authority should be kept distinct and plain before the world, and no laws are to be acknowledged that come in collision with the laws of Jehovah” (Testimonies to Ministers and Gospel Workers, p. 16, 1923 ). John Harris (1802-1856): “He designed the church to be his own peculium; it is the only fortress which he holds in a revolted world: and he intended therefore, that no authority should be known in it, no laws acknowledged, but his own… His high design is, that as Satan has a church (he himself speaks of the Synagogue of Satan) consisting of the children of sin: a church in which men have always laboring to cast off divine law, and to confound between good and evil; so he would have a church in which these essential distinctions should again be restored and exemplified” (The great teacher, p. 222, 1835 ). Ellen White (1827-1915): “Human nature was to him a robe of suffering; and when the crisis came, when he yielded himself a victim to Satan’s rage, when he hung agonizing upon the cross, dying the cruelest, most ignominious of deaths, the hosts of evil exulted, but man was saved…While we contemplate the cross, the Son of God assuming the mass of human guilt, the mystery of redemption seems wonderful” (ST, August 17, 1891). John Harris (1802-1856): “Our nature to him was a robe of suffering, assumed expressly, that, when the crisis of our redemption came, justice might find him sacrificially attired and prepared for the altar… when, being in agony, he had, in a sense, to absorb, the mass of human guilt, and to exhaust, in one short moment, the mighty cup of omnipotent wrath” (The great teacher, p. 105, 1835). Ellen White (1827-1915): “Jesus did not come to astonish men with some great announcement of some special time when some great event would occur, but he came to instruct and save the lost. He did not come to arouse and gratify curiosity; for he knew that this would but increase the appetite for the curious and the marvelous. It was his aim to impart knowledge whereby men might increase in spiritual strength, and advance in the way of obedience and true holiness. He gave only such instruction as could be appropriated to the needs of their daily life, only such truth as could be given to others for the same appropriation” (RH, March 22, 1892). John Harris (1802-1856): “He came, not to astonish, but to instruct and to save, and to instruct solely with a view to save; and, knowing that to feed curiosity is only to increase its appetite, that to impart a particle of knowledge more than is essential to our advance in the path of holiness” (The Great teacher, p. 395, 1835). Ellen White (1827-1915): “When in the fullness of time the Son of the infinite God came forth from the bosom of the Father to this world, He came in the garb of humanity, clothing His divinity with humanity” (ST, may 17, 1905). John Harris (1802-1856): “When, in the fullness of time, the eternal Son came forth from the bosom of the Father, he descended to a region of spiritual darkness” (The great teacher, p. 49, 1835). Ellen White (1827-1915): “But this great sacrifice was not made in order to create in the Father’s heart a love for man, not to make Him willing to save. No, no! “God so loved the world, that He gave His only-begotten Son.” John 3:16. The Father loves us, not because of the great propitiation, but He provided the propitiation because He loves us. Christ was the medium through which He could pour out His infinite love upon a fallen world” (SC, p. 13, 1892). John Harris (1802-1856): “He impresses on us the sublime fact, that the Father loved us, not in consequence of the great propitiation, but that he provided the propitiation because he loved us; because he was bent on obtaining a medium through which he could pour out the ocean-fullness of his love upon us” (The Great teacher, pp. 105, 106, 1835). Ellen White (1827-1915): “Looking upon Him, we behold the invisible God, who clothed His divinity with humanity in order that through humanity He might shed forth a subdued and softened glory, so that our eyes might be enabled to rest upon Him, and our souls not be extinguished by His undimmed splendor. We behold God through Christ, our Creator and Redeemer. It is our privilege to contemplate Jesus by faith, and see Him standing between humanity and the eternal throne. He is our Advocate, presenting our prayers and offerings as spiritual sacrifices to God” (7BC, p. 925; YI October 28, 1897). John Harris (1802-1856): “We behold in the invisible God invested in the robes of humanity and emitting a glory so softened and subdued that our eyes can rest on it without dismay… standing betwixt us and the eternal throne…to raise and present our spiritual offerings… ascends still higher to him that sits on the throne” (The Great Teacher, p. 124, 125, 1836). Ellen White (1827-1915): “I testify to my brethren and sisters that the church of Christ, enfeebled and defective as it may be, is the only object on earth on which He bestows His supreme regard. While He extends to all the world His invitation to come to Him and be saved, He commissions His angels to render divine help to every soul that cometh to Him in repentance and contrition, and He comes personally by His Holy Spirit into the midst of His church” (Testimonies to Ministers and Gospel Workers, p. 15, 1892 ). Ellen White (1827-1915): “The church of Christ on earth will be imperfect, but God does not destroy his church because of its imperfection… The church, enfeebled and defective, needing to be reproved, warned, and counseled, is the only object upon earth upon which Christ bestows his supreme regard” (RH, Sep 5, 1893, AA, p. 12, 1911). John Harris (1802-1856): “The church of Christ, enfeebled and defective as it may be, is the only object on earth, on which he bestows his supreme regard. … While he extends his scepter, and dispatches his angels to every part of the world, he engages to come personally into the midst of his church, and to honor their prayers and decisions by regarding them as laws for his own conduct ” (The Great teacher, p. 225, 1835). Ellen White (1827-1915): “In the matchless gift of His Son, God has encircled the whole world with an atmosphere of grace as real as the air which circulates around the globe. All who choose to breathe this life-giving atmosphere will live and grow up to the stature of men and women in Christ Jesus” (SC, p. 68, 1892). John Harris (1802-1856): “… he gave his only begotten Son, … He gave him, to encircle the whole world with an atmosphere of grace, as real and universal, as the eternal air which encompasses and circulates around the globe itself, and whoever chooses to inhale it hath eternal life” (The Great teacher, p. 112, 1835). Ellen White (1827-1915): “The message of mercy that Christ brought from the Father to man was meant for the ears of the world: “I, if I be lifted up from the earth will draw all men unto me.” Everlasting life has been purchased for man at an infinite cost. “God so loved the world, that he gave his only begotten Son, that whosoever believeth in him should not perish, but have everlasting life.” Through this matchless gift, Christ encircles the world with an atmosphere of grace. All who choose to inhale this life-giving air will have eternal life” (YI, November 9, 1899). John Harris (1802-1856): “The message of mercy which he brought from the Father was meant for the ear of the world. ‘God so loved the World, that he gave his only begotten Son, that whosoever believeth in him should not perish, but have everlasting life.’ He gave him, to encircle the whole world with an atmosphere of grace, as real and universal, as the eternal air which encompasses and circulates around the globe itself, and whoever chooses to inhale it hath eternal life” (The Great teacher, p. 112, 1835). Ellen White (1827-1915): “When Jesus spoke to the people they were astonished at his doctrine; for he taught them as one having authority, and not as the scribes. The scribes had labored to establish their theories, and they had to labor to sustain them, and to keep their influence over the minds of the people by endless repetition of fables and childish traditions. The loftiest models of public instruction consisted largely in going through heartless rounds of unmeaning ceremonies and in the repetition of frivolous opinions” (Sabbath School Worker, April 1, 1899). John Harris (1802-1856): “‘when Jesus had ended these sayings, the people were astonished at his doctrine, for he taught them as one having authority, and not as the scribes.’ Their established teachers, having long since completed the conquest of common sense, labored to preserve the fruits of their victory , by the endless repetitions of fables and childish traditions. The loftiest models of public instruction with which they were acquainted, consisted in the heartless recitement of frivolous opinions and trivial ceremonies, confirmed by quotations more jejune and frivolous still” (The great teacher, p. 83, 1835). Ellen White (1827-1915): “Truth never languished on His lips, never suffered in His hands for want of perfect obedience to its requirements. “To this end was I born,” Christ declared, “and for this cause came I into the world, that I should bear witness unto the truth.” And the mighty principles of truth fell from His lips with the freshness of a new revelation” (21MR, p. 38, 1993). John Harris (1802-1856): “Truth never languished on his lips, never suffered in his hands, from want of sympathy in its advocate. ‘To this end was I born,’ said he, and for this cause came I into the world, that I should bear witness unto the truth.’ And as often as it issued from his tongue, it came with the freshness of a new revelation” (The Great teacher, p. 80, 1835). Ellen White (1827-1915): “He sees his purchased possession the sport of every kind of deception, and knows that the end thereof is eternal ruin. Those for whom he died are absorbed in providing themselves with temporal things that are not required… Christ calls upon them to change this order of things, and to act as rational beings. He would have them use their God-given faculties in contemplating eternal realities. He lifts his voice in warning, saying, “Lay not up for yourselves treasures upon earth, where moth and rust doth corrupt, and where thieves break through and steal: but lay up for yourselves treasures in heaven… When temporal matters absorb the mind and engage the attention, the whole strength of the being is engaged in the service of man, and men look upon the worship due to God as a trifling matter. Religious interests are made subservient to the world. But Jesus, who has paid the ransom for the souls of the human family, requires that men shall subordinate temporal interests to the heavenly interests… He urges that men should seek more earnestly and continually for the bread of life than for the bread which perishes. He says, “Labor not for the meat which perisheth, but for that meat which endureth unto everlasting life… for where the treasure is, there will the heart be also”” (RH, April 7, 1896; The Paulson Collection of Ellen G. White Letters, p. 344, 1985). John Harris (1802-1856): “He finds them absorbed in providing for the temporal future, and he urges them, as they respect their own rationality, not to omit eternity from their reckoning… As the worshippers of mammon make religion subservient to the world, so he requires the worshippers of god to subordinate the world to religion. Instead of exhausting ourselves in efforts after the bread which perisheth, he reminds us that there is an angel’s food, and urges us to put forth our chief endeavors after that… things that form the gold and currency of heaven, things on which God has stamped his image and superscription, and inscribed an infinite value… ‘Lay not up treasures on the earth.’ Said he, ‘where moth and rust doth corrupt, and where thieves break through and steal: but lay up for yourselves treasures in heaven… ‘For where your treasure is,’ he adds, ‘there will your heart be also’” (The Great teacher, pp. xxxvii, xxxviii, 1836). Ellen White (1827-1915): “Though we have but one talent, if it be faithfully consecrated to God, and employed in acts of mercy in temporal or spiritual things, we thus ministering to the wants of the needy, our talent will increase in value, and be noted upon the heavenly record as exceeding our powers of computation. Every merciful action, every sacrifice, every self-denial, will bring a sure requital, a hundred-fold in this time, and in the world to come everlasting life” (ST, September 12, 1895). John Harris (1802-1856): “…his cup of cold water, or his one talent, consecrated to God, has augmented into a treasure exceeding his powers of computations. For every sacrifice we make in his service he guarantees to requite us, – not indeed as of debt; this the magnitude of the requital shows, but od his own exuberant munificence, he promises to repay us a hundred-fold in the present life, and in the world to come life everlasting” (The Great teacher, p. xIiii, 1835). Ellen White (1827-1915): “Jesus came to change this order of things, to correct this widespread evil. He lifts up his voice as the voice of God in warnings, reproofs, and entreaties, seeking to break the spell which infatuates, enslaves, and ensnares men. He presents before them the future eternal world, and addressing them in decided language, says, “For what is a man profited, if he shall gain the whole world, and lose his own soul? or what shall a man give in exchange for his soul?” (RH, February 2, 1897). John Harris (1802-1856): “Now the Saviour addressed himself to the task of correcting this evil… he lifts up his voice like the trump of god, and seeks to break the spell which infatuates them, while he exclaims, ‘What shall it profit a man if he gain the whole world and lose his own soul? Or what shall he give in exchange for his soul?” (The great teacher, p. xxxvi, xxxvi, 1835). Ellen White (1827-1915): “When the love of God is expelled, the love of the world quickly flows in to supply the vacuum. The Lord alone can cleanse the soul temple from the moral defilement” (RH, March 31, 1896). John Harris (1802-1856): “Sin having expelled from his heart the love of god, the love of the world has rushed into the vacuum, and made it impossible for any but omnipotence to dislodge it” (The great teacher, p. xxxv, 1835). Ellen White (1827-1915): “Satan instigated others to rebel, and after they were cast out of heaven he bound them together in a confederacy to do all the evil possible to man, as the only means of striking God. Excluded from heaven, he resolved to be avenged by injuring the workmanship of God. Around the standard of rebellion that he planted, evil workers of all generations have rallied. Evil angels have united with evil men in a warfare against Christ’s kingdom. Satan’s aim had been to reproduce his own character in human beings. No sooner was man created than Satan resolved to efface in him the image of God, and to place his stamp where God’s should be. And he has succeeded in instilling into the heart of man the spirit of envy, of hatred, of ambition. In this world he has set up a kingdom of darkness, of which he, the leader in guilt, is prince. He desired to usurp the throne of God. Failing in this, he has worked in darkness, in crookedness, in deception, to usurp his place in the hearts of men. He has set up his throne between God and man, to appropriate the adoration that belongs to God alone” (Manuscript 33, 1911). 6BC, p. 1119. John Harris (1802-1856): “From that moment he became the avowed antagonist of god; established an infernal empire, and planted the standard of rebellion…and stimulated by implacable hatred against God, he no sooner found our world created, than he came to efface from it the image of god and to stamp his own on its breast. In the execution of this dreadful project he succeeded…Unable to expel God from his throne, and thus succeed to the homage of man; he had, by a universal system of idolatry, planted his throne between the human worshipper and the Divine being, intercepting and appropriating the adoration which belonged to God alone” (The Great teacher, pp. 227, 228, 1835). Ellen White (1827-1915): “Satan well knows the material with which he has to deal in the human heart. He knows – for he has studied with fiendish intensity for thousands of years – the points most easily assailed in every character; and through successive generations he has wrought to overthrow the strongest men, …” (PP, p. 457, 1890). John Harris (1802-1856): “It is only to suppose that Satan has mastered this principle: that the result of many thousand years, in studying the structure, watching movements, and experimenting on the properties of mind is, that he knows the universal bearing and operation of this principle; and what fearful amount of power, what an immense command over the human mind, may he possess in the knowledge of this principle alone” (The Great Teacher, pp. 238-239, 1835). Ellen White (1827-1915): “The Father is not the Judge. The angels are not. He who took humanity upon Himself, and in this world lived a perfect life, is to judge us. He only can be our Judge… Christ took humanity that He might be our Judge” (9T, p. 185). Ellen White (1827-1915): “There is only one Judge—the One who died for us, who took upon Himself our nature and all the infirmities of humanity, that we might stand on vantage-ground with God” (RH, January 19, 1905, p. 9). Ellen White (1827-1915): “God designed that the Prince of sufferers in humanity should be judge of the whole world. He who submitted to be arraigned before an earthly tribunal, He who came from the heavenly courts to save man from eternal death, He whom men despised, rejected, and upon whom they heaped all the contempt of which human beings inspired by Satan are capable, He who suffered the ignominious death of the cross—He alone was to pronounce the sentence of reward or of punishment” (MS 39, 1898). 6BC, p. 1100. John Harris (1802-1856): “‘The Father judgeth no man, but hath committed all judgment to the Son.’… in the cause of virtue, then is it fit that the Judge, the Prince of sufferers, and who is set forth as the type of the happiness which the holy suffering yields, … that he who submitted to be arraigned, and who occupied the cross here, should then ascend the throne as his proper reward…then must it be right also, that in the person of their Judge they should recognize their Redeemer. It will give an additional value to the crown of life, that it will be bestowed by the hand of Christ; that the very being who died for them… if it is proper that the unbelievers should be condemned, … the sentence of condemnation should be pronounced by him” (The great teacher, pp. 274, 275, 1835). Ellen White (1827-1915): “In his teachings, Christ sought to impress men with the certainty of the coming judgment, and with its publicity. This is not the judgment of a few individuals, or even of a nation, but of a whole world of human intelligences, of accountable beings. It is to be held in the presence of other worlds, that the love, the integrity, the service, of man for God, may be honored to the highest degree” (RH, November 22, 1898). Ellen White (1827-1915): “When speaking to congregations, there is always before me the final judgment, which is to be held in the presence of the world, when the law of God’s government is to be vindicated, His name glorified, His wisdom acknowledged and testified of as just to believers and unbelievers. This is not the judgment of one person, nor of a nation, but of a whole world of intelligent beings, of all orders, of all characters” (Letter 109, 1898, 8MR, p. 244, 1900). Ellen White (1827-1915): “The Father judgeth no man, but hath committed all judgment unto the Son.” “He hath given him authority to execute judgment also, because he is the Son of man.” In his super-added humanity consists the reason of Christ’s appointment. God has committed all judgment unto the son, for without controversy he is God manifest in the flesh” (RH, November 22, 1898). John Harris (1802-1856): “‘Father judgeth no man, but hath committed all judgment to the Son.’ He hath authority to execute judgment also, because he is the Son of man;’ in his super-added humanity, consists the very reason of his appointment. … ‘without controversy, God manifest in the flesh.’” (The Great teacher, p. 274, 1835). Ellen White (1827-1915): “Man was to be tested and proved, and if he should bear the test of God, and remain loyal and true after the first trial, he was not to be beset with continual temptations; but was to be exalted equal with the angels and henceforth equal” (RH Feb 24, 1874). Ellen White (1827-1915): “He came to restore the defaced image of God, to raise him, elevate him, fit him for companionship with the angels of heaven, to take the position in the courts of God which Satan had forfeited through rebellion” (RH, May 8, 1894). John Harris (1802-1856): “in… their purified nature… They shall be ‘equal unto angels:’ … they will be able to fill every office that angels fill… they will in every way be worthy of angelic brotherhood” (The Great teacher, p. 294, 1835). Ellen White (1827-1915): “And the Father demonstrates His infinite love for Christ, who paid our ransom with His blood, by receiving and welcoming Christ’s friends as His friends. He is satisfied with the atonement made. He is glorified by the incarnation, the life, death, and mediation of His Son” (6T, p. 364). John Harris (1802-1856): “The Father demonstrates his infinite love to Christ, by receiving and welcoming the friends of Christ as his own friends. He has pledged himself to do so; and he is so complacently delighted with Christ; so fully satisfied with the atonement he has made; feels himself so unspeakably glorified by the incarnation and life, the death and mediation of Christ” (The Great teacher, p. 151, 1836 ). Ellen White (1827-1915): “He had said. “He shall glorify me.” Through the agency of the Holy Spirit, the soul is sanctified by obedience to the truth, and Jesus says, “I am the way, the truth, and the life.” He unfolded to man the important lesson that the sum of all science is to be found in the excellency of the knowledge of Christ. This knowledge can be incorporated into everyone’s experience. The Scriptures declare, “This is life eternal, that they might know thee the only true God, and Jesus Christ, whom thou hast sent” (ST June 9, 1890). John Harris (1802-1856): “And our lord predicted, as the crowning effect of the operations of the Holy Spirit, “He shall glorify me,’ a prediction which is realized in various ways… He engages to renovate the soul through the medium of truth; now what honour does he confer upon Christ, that he should pass by all other kinds of truth… Does he not thus teach us, by his own example, to count all things but loss for the excellency of the knowledge of Christ Jesus our Lord? … This is the sum of all science; this is the only knowledge that can incorporate and mingle with your being; this is life eternal, to know the true God and Jesus Christ whom he has sent” (The great teacher, pp. 186, 187, 1836 ). Ellen White (1827-1915): “The incense of true worship, which should have been offered to God, has been mingled with the worship of self. In the place of lifting their thoughts to God, in the place of learning to know Him better, men deny Him in their lives. Their attention is taken up with objects that conceal God from their view. Thus it is with the great majority of religionists. God calls for sincere heart-worship. The door to light and an intelligent knowledge of the truth is open to every sincere worker for God. In order for worship to be acceptable, it must be offered in faith and hope, and the life must be in harmony with it. God requires the devotion of heart, mind, soul, and strength. Our noblest powers are to be used to do Him homage. Our thoughts are to be conformed to His will” (9MR, p. 386, 1980. [to Marian Davis, April 28, 1904]). John Harris (1802-1856): “The rites of the formalist are his spiritual idols; instead of leading his thoughts onwards to God, they stand between him and the professed object of his worship, concealing God from his view… For if god is a spirit, it follows that our worship, to be acceptable, must correspond with his nature. Accordingly, when we come before him, he requires that the soul, the noblest part of our nature, should do him homage; that our thoughts should relate to him, our affections embrace him, that our spiritual nature should go forth and seek communion with him” (The Great Teacher, pp. 303, 304, 1836). Ellen White (1827-1915): “Put forth your most earnest endeavors to obtain those things upon which God places value, and which Christ gave his precious life that you might secure. His sacrifice has thrown open wide to you the gates of heavenly commerce. Lay up your treasure beside the throne of God, by doing with his entrusted capital the work that he desires done in the winning of souls to a knowledge of the truth. This will secure you eternal riches” (RH, March 5, 1908). Ellen White (1827-1915): “The Lord has thrown open before us the door of heavenly commerce. We are to trade on our Lord’s goods. He Himself is our security if we walk and work by faith. The humblest believer may trade upon the entrusted capital; he may employ all his powers to the glory of God; and the one talent, thus consecrated to the Master’s use, will increase unto precious treasures” (Australian Union Conference Record, March 21, 1910). John Harris (1802-1856): “Yes, by throwing open to us the gates of a heavenly commerce, he would give scope to our aims, security to our choicest treasures, and objects of our most capacious desires… Let them acquit themselves as faithful stewards of the great householder” (The great teacher, p. xxxviii, 1836). Ellen White (1827-1915): “All sin is selfishness” (7MR, 232, 1990). Ellen White (1827-1915): “The Lord desires His people to realize that selfishness is the greatest sin of the world, and that it has also become the prevailing sin of the church” (RH, December 3, 1901). John Harris (1802-1856): “All sin is selfishness” (Mammon; or, Covetousness the sin of the Christian church, p. 10, 1836). John Harris (1802-1856): “Selfishness, the disease of the world, is the prevailing sin of the church” (Ibid., p. 30). Ellen White (1827-1915): “It is the glory of the gospel that it is founded upon the principle of restoring in the fallen race the divine image by a constant manifestation of benevolence” (AG, July 1, 1973). John Harris (1802-1856): “It is the glory of the gospel that it was calculated and arranged on the principle of restoring to the world the lost spirit of benevolence” (Mammon; or, Covetousness the sin of the Christian church, p. 13, 1836). Ellen White (1827-1915): “Satan’s first sin was a manifestation of selfishness. He sought to grasp power, to exalt self. A species of insanity” (7MR, p. 232, 1990). John Harris (1802-1856): “The first presumed sin of the angels that kept not their first estate, as well as the first sin of man, – what was it but selfishness insane?” (Mammon; or, Covetousness the sin of the Christian church, p. 10, 1836). Ellen White (1827-1915): “His life was characterized by noble, disinterested benevolence. His whole life was not marred by one selfish act” (1T, p. 529, 1868). John Harris (1802-1856): “The whole of his course was a history of pure and disinterested benevolence. One continued act of condescension” (Mammon; or, Covetousness the sin of the Christian church, p. 15, 1836). Ellen White (1827-1915): “Selfishness contracts the heart; benevolence expands it. Selfishness is a demon whose name is legion; in every age it has seemed that this demon would drive Christ and the spirit of self-sacrifice out of the world. Through its influence the church is weak when it ought to be a power” (The Bible Echo, February 12, 1894). John Harris (1802-1856): “These are some of the leading forms of that demon of selfishness, whose name is Legion; and which, in every age, has been the great antagonist of the gospel, threatening at times to drive the principle of benevolence from the world” (Mammon; or, Covetousness the sin of the Christian church, p. 45-46, 1836). Ellen White (1827-1915): “The first result of the entrance of sin into the world was the birth of principles of selfishness. The design of the gospel is, by means of remedial missionary work, to confront this evil of selfishness and destroy its destructive power by establishing enterprises of benevolence” (Ellen G. White 1888 materials, p. 1763). John Harris (1802-1856): “… the first effect of sin was to produce selfishness, so the first effect of the gospel remedy is to destroy that evil, and to produce it with benevolence” (Mammon; or, Covetousness the sin of the Christian church, p. 12, 1836). Ellen White (1827-1915): “Christ saw humanity, through the working of the mighty growth of sin, demoniacally possessed by the prince of the power of the air, and putting forth gigantic strength in exploits of evil. But he saw also that a mightier power was to meet and conquer Satan. “Now is the judgment of this world,” he said; “Now shall the prince of this world be cast out.” He saw that if human beings believed in him, they would be given power against the host of fallen angels, whose name is legion. Christ strengthened his own soul by the thought that by the wonderful sacrifice which he was about to make, the prince of this world was to be cast out…” (RH, November 24, 1904). John Harris (1802-1856): “Humanity, to his view appeared as one body, one mighty growth and stature of sin demonically possessed by the prince of the power of the air, and putting forth all its gigantic powers in exploits of evil. But he saw the power of his exorcism at hand and rejoiced; ‘Now,’ said he, ‘is the judgment of this world; now shall the prince of this world be cast out.’ He beheld human nature released from the foe whose name is legion” (The Great Teacher, p. 194, 1836). Ellen White (1827-1915): “The original apostasy began in disbelief and denial of the truth; but if we would triumph, we must fix the eye of faith steadfastly upon Jesus, the Captain of our salvation” (RH, December 6, 1892). John Harris (1802-1856): “The original apostasy commenced in the disbelief and denial of truth; for it is only by clearly discerning and cordially believing it that we remain in a state of allegiance to God” (The Great Teacher, p. 136, 1836). Ellen White (1827-1915): “I am instructed by the Holy Spirit to say, “All who believe the truth are to be the Lord’s messengers.” As disciples they are to learn continually of Christ, how to lift up their thoughts, to enlarge their expectations, and to have the loftiest conceptions of His excellence and grace, that the endowment of His Holy Spirit may compensate for the loss of His personal presence. This the Saviour sought to impress on the minds of His disciples” (The Upward Look, p. 266, 1982). John Harris (1802-1856): “… when he spoke of the Holy Spirit, the Savior would have his disciples to lift up their thoughts, to enlarge their expectations, and form the loftiest conceptions of excellence and grace; declaring, that the advent of the Spirit would more than compensate for the loss of his own personal presence” (The Great teacher, p. 193, 1836). Note: Here we can see how the inspiration works. The Holy Spirit instructs, and the prophet borrows John Harris’ words to convey it to us!!! Ellen White (1827-1915): “Happiness is the result of holiness, and conformity to the will of God. Those who would be saints in heaven, must first be saints upon the earth; for when we leave this earth, we shall take our character with us, and this will be simply taking with us some of the elements of heaven imparted to us through the righteousness of Christ” (RH, August 19, 1890). John Harris (1802-1856): “…on departing from earth, that which goes to be examined at the bar of God is the unclothed soul, the naked human character… They are blind to the important truth, that the happiness of heaven will principally result from holiness and conformity to God: that so far heaven commences with the Christian on earth; and that when he leaves the world, he takes the elements of heavenly happiness with him, so that it is only by becoming a subject of the kingdom of holiness now, that he can enter into the kingdom of holiness hereafter” (The Great Teacher, pp. 322, 323, 1836).